Each month of the school year, the Lakeville Rotary Club recognizes students of the senior class who demonstrate “Service Above Self”. For the month of October Lauren Grimm has been chosen as the October Rotary Student of the Month for Lakeville North High School. Lauren’s parents are Michael & Kelly Grimm and her Dean is Dan McNulty. Lauren has been very involved at Lakeville North High School as Junior Class Officer and currently in Mock Trial as Captain. Lauren is a member of DECA, having won several awards; a member of National Honor Society; an Officer for Best Buddies. Lauren is also on the Speech team, is involved in Youth Teaching Youth, and a member of the Tennis Team. Lauren maintains a high GPA and class rank at Lakeville North High School. Outside Lakeville North High School, Lauren volunteers at Hosanna church, has been on a Mission Trip to Dominican Republic, volunteers as a camp counselor. She is also currently working at Target. 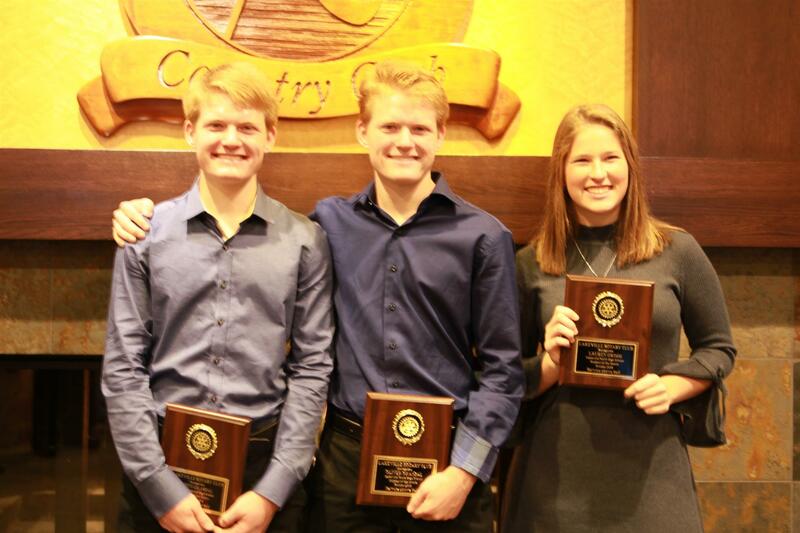 Lakeville South High School will recognize Espen and Oliver Grasdal as the Lakeville South High School Rotary Students of the Month for October. Espen and Oliver’s parents are Inge & Tracy Grasdal and there Dean is Dana Kelly. Oliver and Espen are extraordinary students that have excelled in many areas during their 3+ years and are ranked #3 and #4 respectively in their class of 432 seniors. They are captains of cross country, alpine skiing, and track. Their average ACT is 35.5 and their average GPA is 4.39. Collectively, they have scored 12 fives and 2 fours on their AP exams and both have been awarded AP Scholar of Distinction. I discovered that Oliver loves speed, whether it be running or four wheeling, it doesn't matter. Espen likes to work with his hands and fix things so he is typically fixing the things that Oliver breaks when going really fast. As far as post-secondary plans, Oliver and Espen are pursuing appointments to one of the military academies, in particular, the Air Force Academy.